BARR, WILLIAM ( 1867-1933). Painter. Borin in Glasgow, Scotland on April 26, 1867. Barr began his art career as a student at the Glasgow School of Art (1895-98) followed by work at South Kensington (London) and Académie Julian in Paris (1904). He then taught at the Paisley School or Art in Scotland for 10 years. After making a reputation in his native land, he first visited California in 1912 and after joining the throngs who came to SF for the PPIE in 1915, decided to remain. 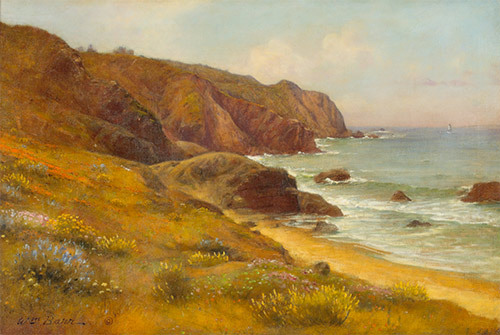 Working from a studio in his home at 311 Lyon Street, he painted romantic and historical interpretations of California including genre scenes, figure studies, and landscapes as well as many portraits of prominent local citizens. Having studied the Old Masters, he carried their spirit into his work. Barr died in SF on Feb. 25, 1933.